They pitch their art as pop music… but, intentionally or not, the lyrics are infused with spiritual—not religious—meaning. It was through a series of those conversations, actually, that 3.12 was born. We’d be talking, two of us, about the “stuff” in our lives, and we’d reach that point where you run out of words and your eyes focus elsewhere. Then, after a few breaths, one of us would sigh, and say with quiet wistfulness, “I miss singing with you. Our group name (discovered only after a lengthy period of introspection, prayer, and study) is a reference to the biblical book of Second Corinthians—chapter 3, verse 12 of that book says that “Because we have great hope, so we act with great boldness. May our ministry always live up to that calling. Reached 50th in Best of Pop chart in 2014. In the top 100 for 16 weeks. Reached 55th in Best of Pop chart in 2013. In the top 100 for 9 weeks. 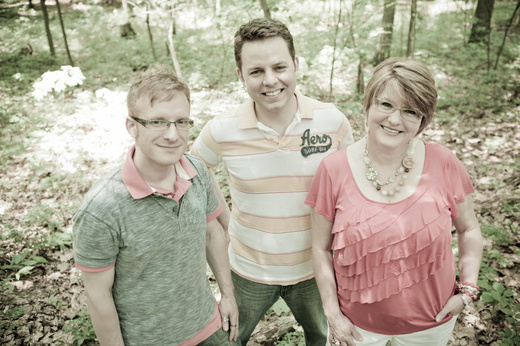 For Deb McClain, David Glasgow and Jason Whetstone, their journey from church singers to recording artists has as much to do with their personal spirituality as it does with their personal harmony. After leaving the Harrisburg church they were attending, the three friends found that they missed singing together. They met one afternoon at a recital hall at Dickinson College in Carlisle, where Glasgow, a pianist and music teacher, worked. They started to meet there once a week to escape their busy lives and get lost in their singing, for sheer leisure. But the more they worked on tones and harmonies, the more they began to believe the possibility of making it as a musical group. “We figured out we can do this,” said Whetstone. “We’re good performers.” That was autumn 2005. 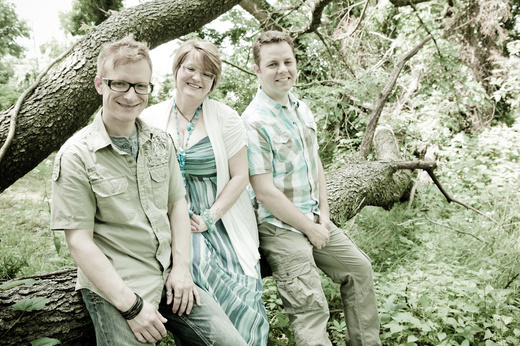 Soon, Three Twelve, as they came to call their group, began performing at churches, festivals and coffeehouses. The response was electric. They cut a Christmas record and, a year later, another with two songs. Demand for their singing increased, and three years ago they began work on a complete album, “Something Begun,” with all original music. They raised $1,800 on pre-CD sales to cover the recording costs. The CD has the sound and rhythm and lyrics of popular contemporary music, yet the words, while catchy, offer deeper meaning. “We really hope our music reaches a multi-dimensional age group,” McClain said. 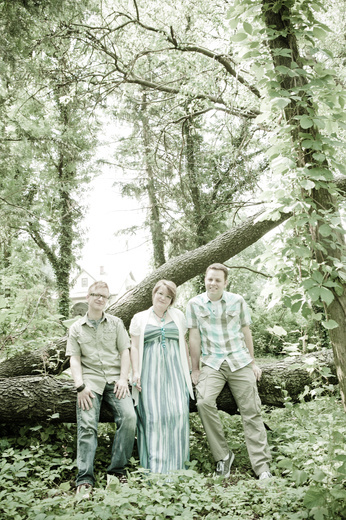 “Our big hope is that you’ll be hearing us on the radio some day.” They pitch their art as pop music for the family, but, intentionally or not, the lyrics are infused with spiritual—not religious—meaning. 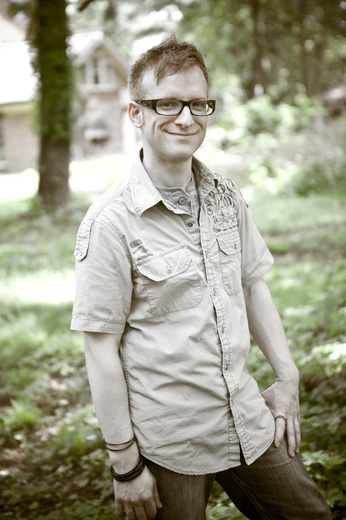 Glasgow, who teaches piano technique and music theory, writes the group’s music. “When I’m writing the lyrics, I try to be abstract about personal things,” he said. “We all feel anger, sadness, happiness—the experience around these emotions is less important than those emotions.” He connects the listener to emotions and spiritual aspects as in the song, "Make It": Found myself on a street in a city/Didn’t know where I was, where to go/Wanting grace, needing hope, craving pity/as the wind began to blow … We don’t have to make it on our own/We who once were strangers, now companions …" “The best songs, on the surface, are talking about really simple, everyday, almost elemental stuff: a river, a tree, a storm—even a dinner party or a bus ride,” Glasgow said. “But when you sit down and really listen through the metaphors, you hear yourself, somehow. It’s a very intimate feeling.” Whetstone, a Lewisberry native who attended the Cleveland Institute of Music and worked as a freelance studio engineer in Nashville for a period, recorded the group’s album and then had it mastered to ensure quality sound for radio play. Although their music features Glasgow on piano and Whetstone on the penny whistle, their sound is not instrumental. Whetstone said. “Our sound is the vocals.” For more about the group or to purchase a CD, visit threetwelve.net. 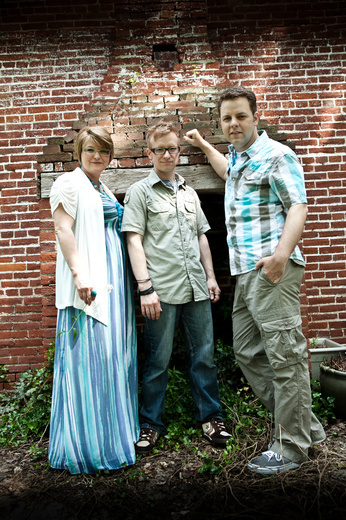 Three Twelve is David M. Glasgow on vocals and keyboards, Deb McClain on vocals and Jason Whetstone on vocals, digital instruments, pennywhistles and trombone. 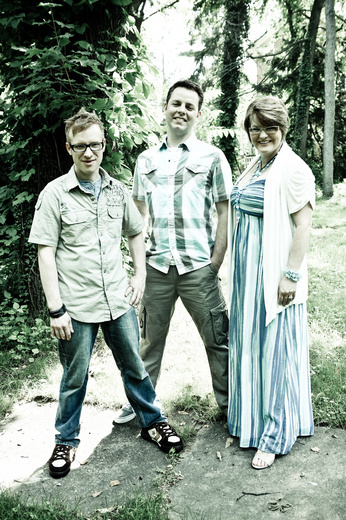 The trio recently celebrated the release of its first full-length album, “Something Begun,” which showcases the band’s tight vocal harmonies and myriad of musical influences — pop, folk, classical, Broadway and more — grown out of a simple love of singing together. 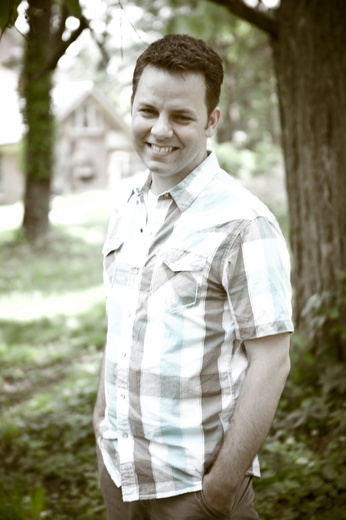 “Jason and I met when he played Judas in a production of ‘Godspell,’ for which I was musical director and Jesus, at [Metropolitan Community Church] in Harrisburg,” Glasgow said. 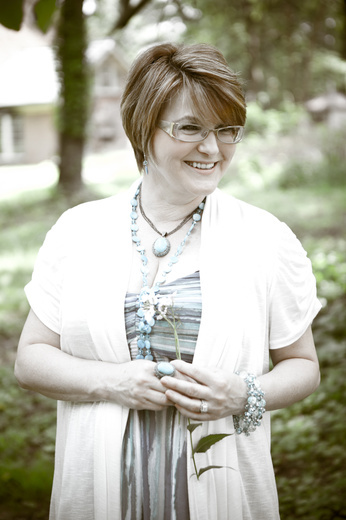 “I responded to auditions for a female vocalist for a quartet that led worship at church and became quick friends with David,” McClain chimed in. 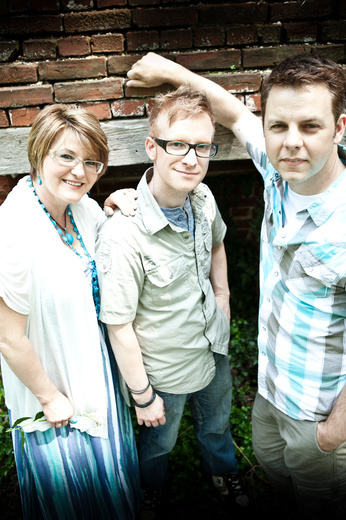 “Jason did the sound for the church at that time, both good souls that I connected with.” In 2005, David left that church, but the trio decided to continue singing together. “The three of us somehow decided to meet ‘just to sing through some stuff,'” Glasgow said. “It kinda stuck.” After several months, David received an invitation to sing and asked if his friends could join him. When the person on the other line said yes, “we sang as a group in public for the first time,” McClain said. “People loved our harmonies and the authentic place from which we shared our music.” Glasgow is the group’s main songwriter, who draws on various influences and styles for inspiration. “Musically, I’m basically a big mutt,” he explained. “My bachelor’s is in theory and composition, so I’ve studied classical composers ... but I’m a sucker for the kind of soul-stirring energy you find in Broadway’s great 11 o’clock numbers. And I love the power and vulnerability of the African-American gospel choir traditions. Those kinds of chords sneak into Three Twelve’s charts more often than I intend, probably.” Besides the original pieces, a cover or two will occasionally find its way into a live Three Twelve performance. But not any cover will do — the song in question must support the band’s musical values. “Basically, we want to emerge on the other side of working with this song better musicians, and better people, than when we went in,” Glasgow said. “And we want our audiences to feel that way, too, after hearing it.” Combined, these elements create a great deal of musical diversity, although the group’s focus is on the performance. “It’s all about the vocals,” Glasgow said. 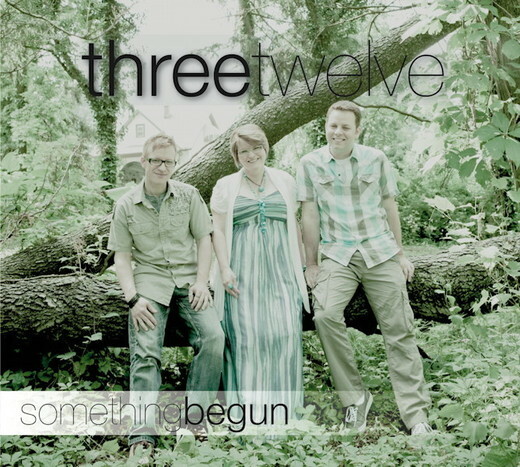 “With very few exceptions, all of our charts are really about the energy of close-harmony singing: the vibrancy and vitality of three voices creating dissonance and resolution.” To learn more about Three Twelve and hear samples from “Something Begun,” visit threetwelve.net. “Full Band” adds drum set, bass, guitar, auxilliary keyboard, and hand percussion. “BGVs” adds up to six BackGround Vocalists, each of whom requires an additional vocal microphone. For some larger gigs, we arrange for a backing “Choir,” which can be mic'ed as an ensemble.